Castanea dentata staminate (male) catkins. commons.wikimedia.org (Accessed 12/2017). Castanea dentata was formerly a dominant forest tree to 30 m, now reduced to root sprouts by chestnut blight, Cryphonectria parasitica (Endothia p.), a fungus introduced from Asia about 1904. Roots sprouts often grow large enough to flower and fruit but typically are attacked when mature bark begins to fissure. Young bark dark gray, shiny. Leaves narrow, about 15 cm long, coarsely, regularly toothed. 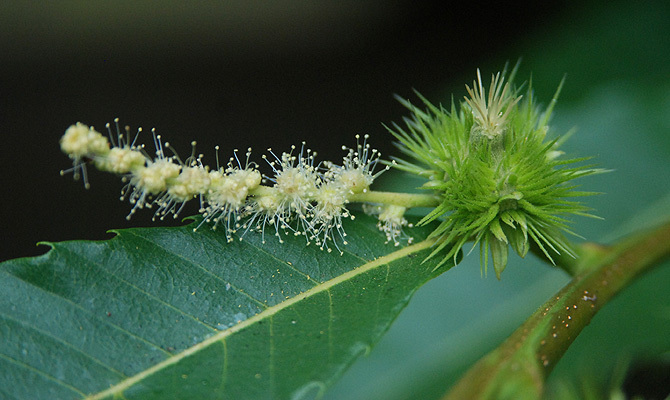 Castanea dentata male and female flowers on one stem. Copyright ©, Oregon State University, 1999-2015. Oregon State U. Dept of Horticulture. oregonstate.edu (Accessed 12/2017). Flowers monoecious, staminate (male) catkins to 20 cm long; pistillate flowers in small cluster at base of inflorescence stem. Castanea dentata fruit and male catkins. Dr. Chris Briand. © Salisbury University Arboretum 2009. salisbury.edu (Accessed 12/2017). Fruit spiny, about 5 cm wide, hard, containing 2 nuts. Formerly an important food of many mammals and larger birds (wild turkey). Castanea dentata ripe fruit. Fruit Warehouse. fruitwarehouse.blogspot.com (Accessed 12/2017). 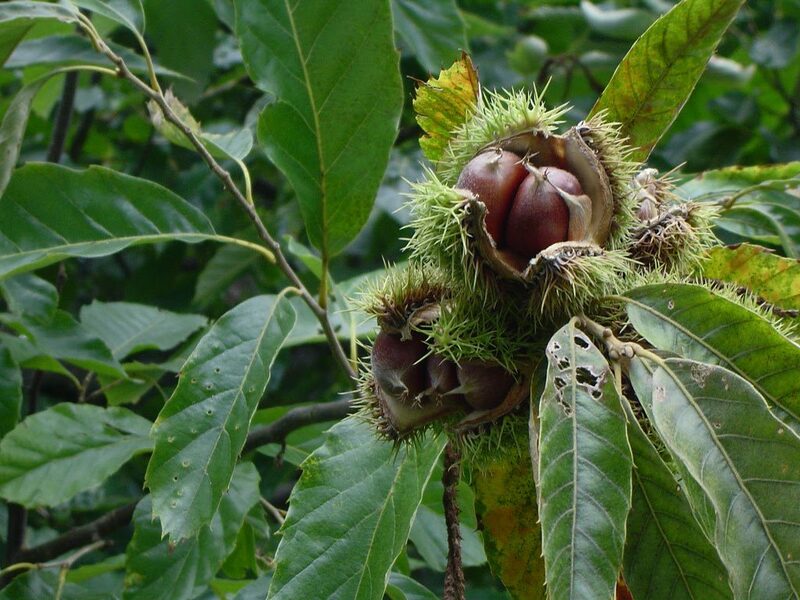 Castanea dentata.Native American Chestnuts before the blight.Harriet Carter.Native Tree Society (Accessed 1/2016). 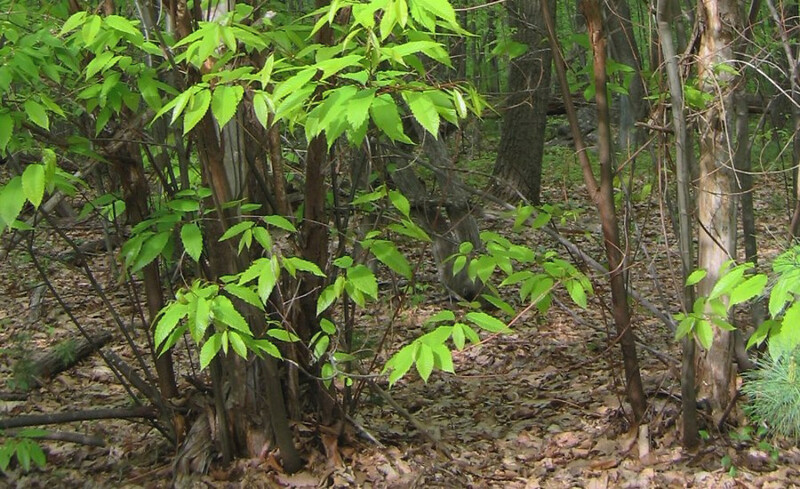 Notes: Chestnut sprouts are an indicator of mature, undisturbed forest because the land has not been cleared for agriculture for at least 150 years or longer. This means that the native soil remains intact and undisturbed. It is possible that chestnut was brought north into previously glaciated areas by Native Americans who used the nuts extensively (Russell, 1987). 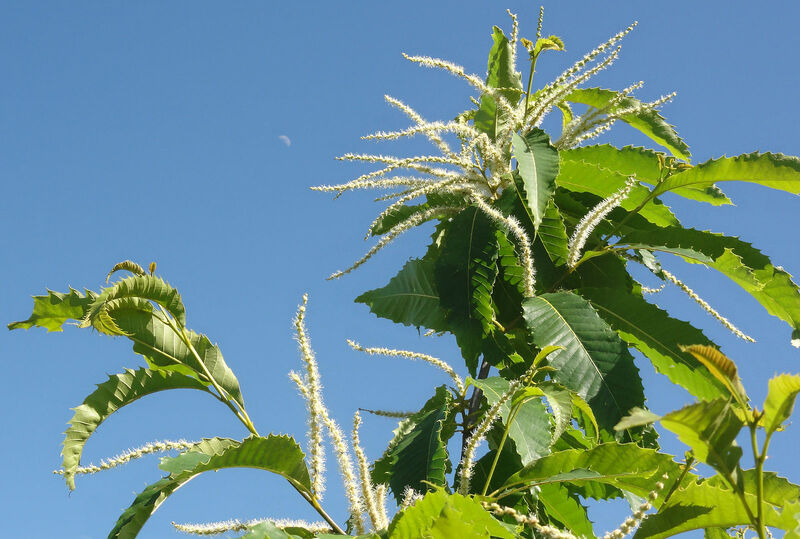 Chestnut appears to have been replaced by a number of other trees including beech, red maple, black birch and oaks (Good 1968). 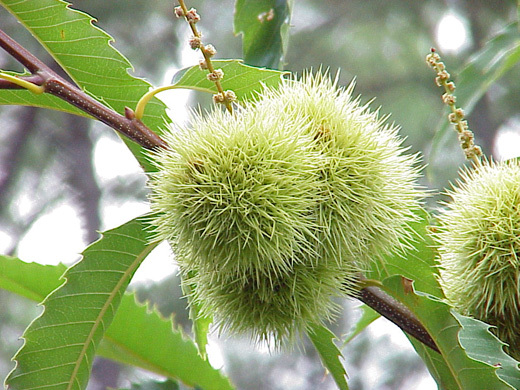 However, chestnut may have become a dominant after extensive logging activity by European settlers due to its ability to root sprout. 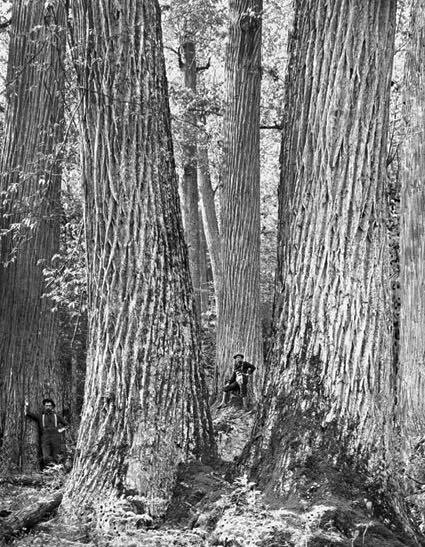 There is evidence from pollen studies that it was not a dominant tree in pre-European times but became dominant during the 19th century during extensive logging because of its ability to resprout after repeated cutting. Deer eat twigs. (Whitney 1994, p.78, 226; Martin et al. 1951).